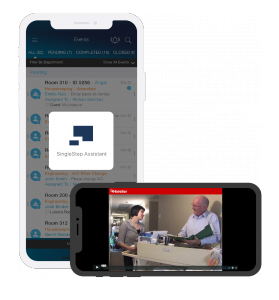 SEATTLE, WA, USA, October 25, 2018 /EINPresswire.com/ -- Nuvola1, a hotel optimization and guest engagement software company, today announced it is partnering with SingleStep2 by Mediafolio Technologies and eHotelier3 to create a new method of ensuring quality standards and guest services are met at hotels worldwide. Together, these three industry-leading companies will combine their expertise to launch an easy-to-use training and productivity solution for all aspects of hotel operations. The solution is designed to equip hotel staff with effective tools to efficiently follow standard operating procedures and ensure best-in-class guest experiences are delivered on a consistent basis. Nuvola is a holistic hotel software company that integrates property standard operating procedures into its proprietary system, leading to more efficient back-of-house operations, asset management, and guest engagement. The company offers hotels a cloud-based solution that is intuitive, scalable, and develops a system of staff accountability. Created by hoteliers who have a first-hand understanding of select-service, full-service, and resort-style property processes, Nuvola is constantly working to enhance both the staff and guest experience through its in-house innovation team and integrations with third-party hotel systems. Visit www.mynuvola.com to learn more. Mediafolio Technologies, Inc was founded in Seattle, Washington, in 2013. The company’s robust internet platform has been used to build display control software for stadiums, 911 dispatch centers, corporate theaters, and most recently for its flagship platform, SingleStep, which is in use by hotels worldwide. SingleStep is the only intelligent training platform that uses context to deliver timely, incremental content to your workforce so employees can provide more consistent, on-brand services while spending less time learning directly from supervisors Visit www.singlestep.com to learn more. eHotelier.com is the world’s largest online hospitality portal, currently serving over 200,000 hospitality professionals from 196 countries around the globe. A progressive and innovative digital business, eHotelier provides continuous and invaluable professional development to industry professionals through online learning, career development, reference materials and collaboration. We provide the ability for anybody in the hospitality industry from Student to CEO, to learn from the world’s best industry experts. eHotelier has learning materials created by specialists from some of the best associations and institutions around the world. Courses are specifically created under the guidance and endorsement of leading industry educators, and recognized globally. Learn at your own pace online from any mobile or web device worldwide. With currently over 130 courses available, never stop learning and unlock your full potential to continue watching your hospitality career grow. Globally industry leaders are relying on eHotelier to grow their careers, their teams and their businesses. Join an impressive alumni and network with other likeminded industry professionals all passionate about developing their careers.